For small and medium-sized enterprises it is often hard to decide for the right SAN solution to cover all storage needs. They are looking for a reliable storage with high-end features (like auto-tiering, metro clustering, synchronous mirroring,…) for an attractive price. In addition, operation and maintenance should be easy and time-saving as they do often not have the necessary and specialized staff resources. But even large enterprises have the same demands when it comes to managing IT infrastructure in remote and branch offices (ROBO). One solution that can cover these requirements is StorMagic’s SvSAN. Simply said, you take two or more low-cost servers and StorMagic’s piece of software to provide a high-availability virtual SAN solution for your VMware vSphere or Microsoft Hyper-V environment. When you configure a two-node cluster it is required to implement a witness (quorum) in a third physical location to deal with split brain scenarios. StorMagic names this quorum as Neutral Storage Host (NHS). It is available as an appliance or as a Windows/Linux based installation. A great advantage here: the requirements for the NHS are relatively simple to fulfill. It tolerates latencies of up to 3000 ms and requires only 9 Kbps bandwidth per mirrored data store. As flexible as the solution is licensing. It is based on the usable storage capacity. The smallest license starts for up to 2 TB, next steps are 6 TB, 12 TB and last but not least for unlimited storage. The good news is, that there is a fully functional evaluation license available. So you can test the software for free before you have to decide if you purchase it or not. 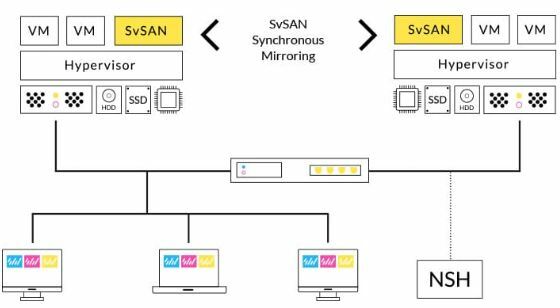 StorMagic’s SvSAN offers a lot more features. If you want to learn about them in deep, I recommend you to watch StorMagic’s presentation during Tech Field Day 13. If you have time you can join the live stream, or you watch the recorded videos later on. In only two hours time you will learn everything important in a compact manner. StorMagic at TechFieldDay 13 (#TFD13) -> time and date coming soon!